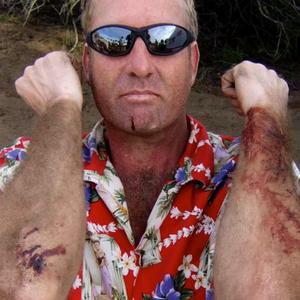 Long time Plonkers member, and my good friend, Johnny Ringo suffered a nasty desert racing crash last Sunday. The last report I got is he's in the ICU with two broken vertebrae in his neck. He's currently at Arrowhead Regional hospital in Colton. His wife, Jennifer, has been posting updates on facebook. Heal quickly, Johnny! Johnny had surgery on Jan 27th and all went well. I visited him last Sunday and he was alert and in good spirits but still in a lot of pain. In the near future he'll be moved to Loma Linda hospital for extensive physical therapy and rehab. I have no doubts that Johnny will make a full comeback, but in the meantime keep him in your thoughts..
We'll try and keep y'all updated here on the site. Meanwhile, throw your healing thoughts to Johnny. Johnny, as always, a bit bloody, and always defiant. Heal up, Ringo! Older PostThe Jack Volder Round Up.